Just recently I bought this bunting on ebay. 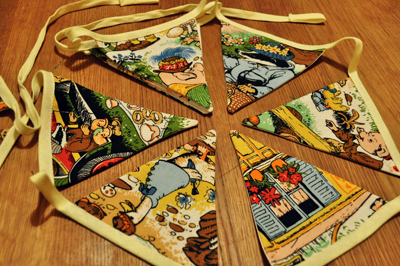 I was on the look out for bunting for ages so I was so happy when I finally found one I liked! I wanted a design that was not too twee or country-chic/ shabby-chic. And I didn’t want to go for the usual tricolour of red, white & blue that I’ve been seeing everywhere. 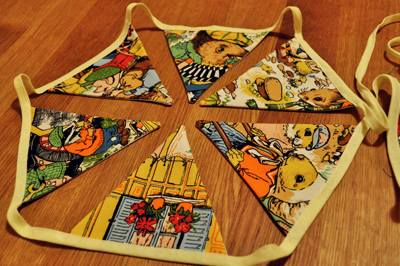 This lovely handmade bunting is in an old & rare Cranston print fabric called Bank Holiday. Depicted are dressed up woodland animals enjoying themselves at a country fair. I have the bird design on the cheesecake & on the chocolate tart (pictures of those can be found here & here.) Then there are bunny shaped biscuits on the large cakes & tarts too (picture of the biscuit can be found here). I also have tiny yellow birds clipped on the cake racks! So having this new animal bunting is just the fitting addition, I think! Anyway, hope all is well everyone, & I do hope to write another recipe for here soon…!! 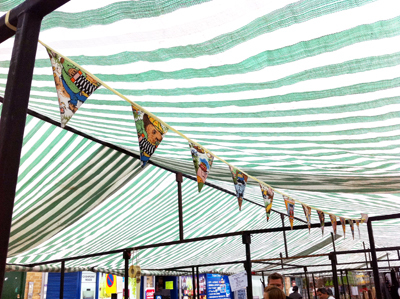 the bunting fits in so perfectly for your stand! I’m getting in touch with you today about a gastronomic project, in association with a famous brand of the art of cooking, which could interest you. To be able to send you all the information about this exclusive project, in which we would like you to take part, would it be possible to send us your name, first name and e-mail address ? Hello Sandrine, I will email you shortly. I REALLY need to come and visit your stall soon! Just been flicking thru ‘jamie’ issue no 23 and see you got a mention in ‘stall tales’. This made me look up bunting on the internet. I had always thought it was just something warm to bundle a baby in…who knew it was also something decorative! It is lovely, by the way, I have never seen any quite like it. And thanks for expanding my vocabulary a little bit!! 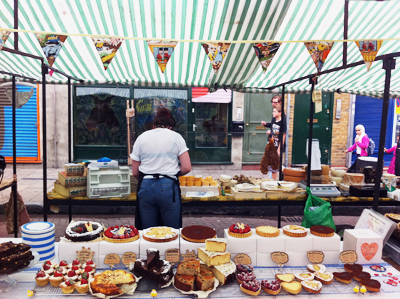 I love your stall ,and I want to see it for real and I’ll buy all your terrific cakes !!!! THIS BLOG IS NO LONGER UPDATED. MY NEXT BLOG IS AT www.basicsofhappy.com. Tamami on I bought a non-plastic kettle! Niki on I bought a non-plastic kettle! I bought a non-plastic kettle! Coco&Me chocolate workshop in Paris! Link to Chocolate & Zucchini! First ever Coco&Me baking lesson! Spring! The day the sky turned blue. What’s been going down lately. Don’t forget! It’s Craftacular this Saturday!